Coach Pete Carroll said on his Monday morning radio show that Russell Wilson has a sprain mild enough to probably allow him to play Sunday. But the Seahawks are scanning the free agent QB list. It’s only a sprain, and apparently a mild one. 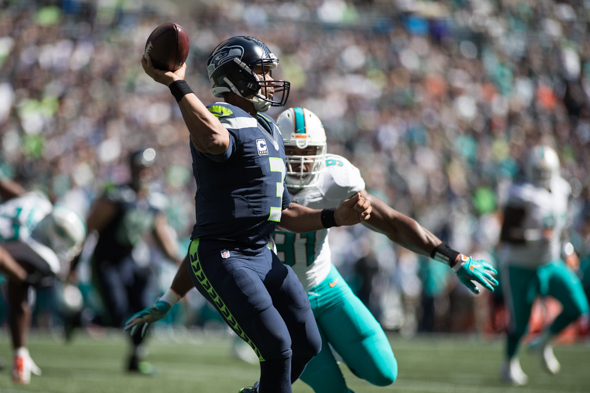 So said coach Pete Carroll Monday morning, the day after QB Russell Wilson injured his ankle Sunday in the 12-10 win over Miami, causing the Seattle sports world to gasp, swoon and despair: In his fifth year, Wilson had the first threat to his playing time. X-rays revealed no structural damage. But Wilson was clearly diminshed after being stepped on by Dolphins all-pro DT Ndamukong Suh — accidentally, not intentionally — during a sack with 11 minutes remaining in the third quarter. He finished the game, completing six of nine passes in the game-winning final drive. Practice time for Wilson ahead of Sunday’s game in Los Angeles against the relocated Rams will likely be minimal. Carroll also said discussions are underway about whether to bring in a veteran backup to supplement undrafted free agent rookie Trevone Boykin, who was inconsistent in the preseason. Wilson has never missed a practice, much less game time. That’s part of why the Seahawks took a risk in a cheap backup rather than a veteran. But the available veterans (list here) does little to suggest an uptick over Boykin, unless Carroll thinks Tarvaris Jackson, Matt Flynn or Charlie Whitehurst, all former Seattle backups, would offer emergency relief over a short period. Carroll said a big part of the success of the final possession was improved pass protection. Carroll also said he thought Wilson enjoyed succeeding after injury. Classic dissemination of mis-information. Every coach does it, but Carrol is the best at it.